The Honeywell Dolphin 9700hc is a rugged digital assistant with multi-functional data collection and communications capabilities. The Dolphin 9700hc is equipped with a large, high-resolution display that provides superior readability of on-screen data, such as patient information. 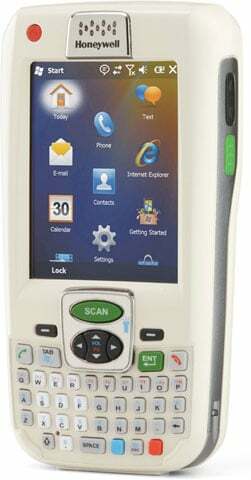 The ergonomic form factor, designed for comfortable use and easy in-pocket storage, combined with the latest wireless technology, enables providers to perform fast and accurate bedside patient care and instantly transmit updates to electronic medical records. Additionally, Honeywell's Shift-PLUS power management system powers real-time wireless and multi-media applications continuously for eight hours or more, supplying nurses with a dependable device that will last throughout their entire shift. Hand Strap Kit (with Mounting Hardware) for the Dolphin 9700. Non-Cancelable/Non-Returnable. USB COMM Charging Cable Kit (with Snp on Term Connect Cup, US Power cord) for the Dolphin 9700. Non-Cancelable/Non-Returnable. Health care HandStrap Kit (Includes Mounting Hardware) for the 9700. Non-Cancelable/Non-Returnable. The Honeywell 9700LP0007Q12EH is also known as HHP-9700LP0007Q12EH	.